The community of Kaka’ako is nestled along the coast of Oahu’s south shore, known as a rich historic site and business center of Honolulu. Once home to ancient Hawaiian royalty, Kaka’ako’s fertile grounds, and abundant resources allowed it to develop into the retail, commercial, and entertainment district that it is today. Kaka’ako is located just east of downtown Honolulu and contributes to the diverse blend of cultures, cuisine, and traditions of the city. As a result, Kaka’ako has become the ultimate social, commercial, and recreational hub for the island of Oahu. This exceptional community offers wonderful amenities, conveniences, and recreation to Honolulu natives. 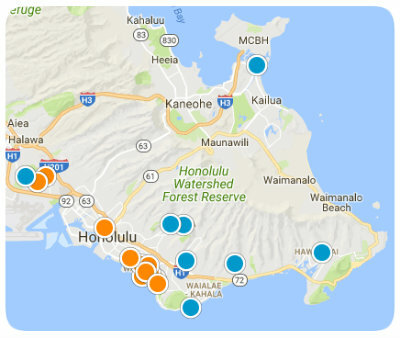 Those who reside in and near the Kaka’ako district love the close proximity to sandy beaches, ethnic eateries, and local supermarkets. Residents also enjoy numerous parks, such as Kaka’ako Makai Gateway Park, Kaka’ako Waterfront Park, and Mother Waldron Playground, where children and families gather to play on sports fields, jump in the ocean, or enjoy picnic areas. As the main roads of Ala Moana Boulevard and Kapiolani Boulevard run through the community, these central streets are always lined with individuals walking through the gallery of unique shops and businesses. From everyday access to shopping and dining to the diverse range of entertainment opportunities, the Kaka’ako community offers each resident a wonderful and quality living experience. Kaka’ako is the perfect destination for those who love the excitement and energy of the busy city, as home buyers from across the island of Oahu will be impressed with daily views of the city skyline and endless ocean. Due to the crowded nature of downtown Honolulu, Kaka’ako hosts many townhomes and condominiums. With space ranging from 500 to nearly 3,000 square feet, you will find prices from affordable studio apartments to luxurious penthouses. Home to nearly 12,000 residents, Kaka’ako has become the perfect location for individuals who enjoy a city lifestyle where you can work, live, and entertain in one place. If you would like more information regarding homes for sale in Kaka’ako, Hawaii, please allow us to assist you and contact us today. This listing is for a parking stall only and not a dwelling unit.